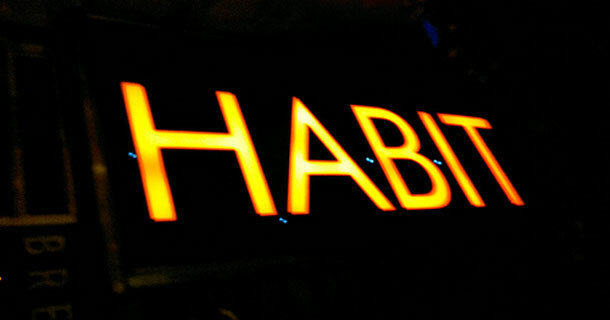 Below is a reflection about this post related to setting up a habit environment. If you haven’t read through it yet I recommend giving it a read. Leo makes some very good points about how to go about setting up a habit environment, many of which can be applied and adapted to creating a “language habit environment”. This is especially helpful if you’re living in a place where you aren’t surrounded by your target language on a daily basis. I’ve come up with a list, and some examples, of how you might go about changing this language habit environment. It can be difficult really immersing yourself in the language when you aren’t surrounded by it on a daily basis. It isn’t easy to just go to a local coffee shop, bookstore, or restaurant and have the language everywhere around you. Still, there’s something you can do at home–and that is to create your own language habit environment–a bubble of immersion in the language, if you will. Set mini goals that can be accomplished in a day, such as number of characters to learn, learning five new vocabulary items for the kitchen, etc. Chain behavior with language, linking the language to a habit such as using a computer, Facebook, etc. Focus first on things you enjoy doing daily, and build language habits around those. Some examples of things you can change that will help you build out a language habit environment. Switch your phone or computer system’s language into the language of choice. This has the added benefit of many of the apps, websites, etc. you visit will be displayed in that language as well. Find background audio to have going all the time: movies, TV shows, news programs, and even music. Many of which have subtitles, which will help with comprehension. There’s also plenty of YouTube channels you can find with people doing video game play-throughs or introducing food, unboxing items and more. Online courses! There’s a lot of free online courses now, many through Coursera, that you can take and sit in on or have going in the background. Here’s a list of courses through National Taiwan University, and another set through Peking University, including some Chinese courses. Use language labels (along the lines of Sticktionary) to mark items around the house you see and use on a regular basis. Read as much as you can, and if you can find books in the language have them handy to just be able to pick up and read during the day. Start a personal blog in the language, where you can track progress. Think as much as you can in the language. Plan your day in the language, write out notes, to-do lists and shopping lists in the language. If you have a local Asian grocery store or market, head up there and buy a few items. Practice reading the food labels and try some fun new items (except, maybe, durian). Make use of online and offline sources like Clozecards or Anki to keep the immersion going. Find your interests and pursue them in the language. All that’s left is an environment waiting to be changed. Let me know in the comments below how it goes!